Now. While it’s easy. And inexpensive. But, I’m here to talk about YOU! You are the spiritual leader of your business. What if… It’s not just business, it’s personal? And maybe more personal than you think? To the voices of all the wise teachers I’ve known and studied, I humbly add my own personal experience, learning and methodology so that other entrepreneurs can access their true power and way of being. As far as I know, I’m one of the few who has studied personal development (some call it “awareness & consciousness”) for more than 37 years, applied it directly to building and running a business, and then wrote a book to share what I learned! Punching, kicking, and screaming all way to the top… getting myself knocked down 7 times getting 8… and what you can apply toward your own business success. and why we do it is unconscious. meaning they’re successful, but cannot tell you what they did. I would add that it’s equally important to remember to learn from our successes. so you could recreate them for yourself. and take appropriate action for everyone’s good. I hate it when good products, companies or people fail! And I wanted to share what I’ve learned from building my own business over 30 years compounded by creating software to help others build theirs. ⇐ Click on this brief video and I’ll tell you about it. In 1980, I attended my first “awareness & consciousness” workshop. Magic occurred and I’ve been studying and practicing it ever since! (I’ve been through the “woo woo” and the “magical thinking” stages and here I teach what I think of as a “pragmatic consciousness.”) And, for what it’s worth, I started my own martial arts training about the same time I started Business Power Tools (originally known as JIAN) and immediately noticed many parallels. You might even think of your own business as your opportunity for a conscious awakening as if your business were a spiritual dojo. It can offer a reflection of your own ethos — look within and fix / update(?) your own thinking before you try to fix everything and everyone else! I’ve been infusing this perspective, knowledge, and experience into Business Power Tools products and blogs in order to educate and influence people through business. I like to think of Business Black Belt as an action manual of higher awareness and applied intuition! There are more than 100 insights, tricks, tips, hacks and ideas to help you to see danger before it gets you, not “step in something,” as well as make better decisions faster. 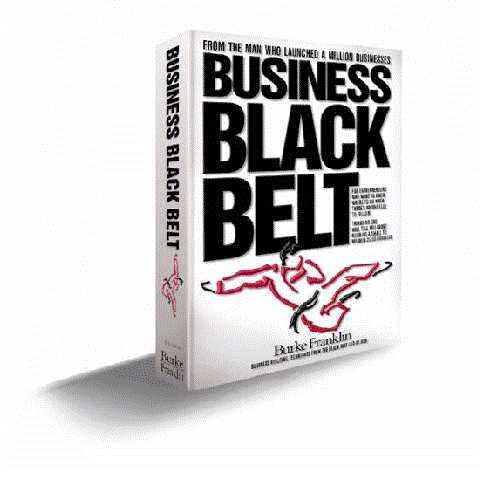 Business Black Belt makes a great gift for the entrepreneurs in your life! “Mr. Franklin is coming from a place of ensuring competitive advantage by assuming that he cannot rest on his laurels and stop marketing or valuing customers. I appreciate this very much. I agree that even that even the invoices and phone contacts with clients are sales components; they represent your company’s tone and values. “I loved Business Black Belt! This book is a uniquely powerful success manual. It is jam-packed with useful insights that will enable you to win in business and in life. Author Burke Franklin has total credibility thanks to his accomplishments in the martial arts combined with his brilliant career in business. Compared to this tour de force, most other business books I read spend lots of pages hitting and missing and groping and fumbling when it comes to delivering practical information. This one flies to the mark over and over again, on page after enlightening page. Most unusual of all, and most gratifying, is that Franklin genuinely succeeds in applying lessons from the martial arts — and from other forms of physical endeavor — to the world of business. The typical book that promises benefits from a field of endeavor outside of business, be it sports, war, or whatever, never actually succeeds in importing the mastery of one field into another. I suspect that the reason the attempt so often fails is that it was never intended to be much more than a gimmick for a clever title. In the case of Business Black Belt, the different disciplines are truly merged. There is also a rare sense of thoughtfulness. The ideas Franklin presents are not off-the-cuff notions slammed down on the page to meet a publishing deadline; they are hard-won insights culled with honesty and integrity from his own experience and set down with clarity so that the reader can profit from them. “Once I started reading Business Black Belt, I couldn’t put this unique book down. It is a compendium of information, anecdotes and lessons that can be easily and immediately, applied to transform effort into success. Since the beginning of my career, I knew I wanted to have my own company and I wanted to learn as much as possible about human nature, including my own, as applied to starting, building and managing a successful business. I took my very first self-improvement workshop in the winter of 1980, it was called “Playground” written by Paul Larsen of Summit Workshops (formerly he had written several workshop for Werner Erhardt of the est training). I went because I had just read Winning at Office Politics and my motive was to ingratiate myself at Texas Instruments with our Operations Manager who had invited me. I was blown away by what I experienced and learned! It was a workshop actually designed for actors to enable them to more fully get in touch with their emotions and to truly express themselves in the parts they played. It felt great, my mind quieted, I felt connected — and learned to recreate these states, when things got jangly. My favorite story to tell to illustrate the bizarre-ness of these workshops is about the one where they played sounds while we listened and wrote in stream-of-consciousness, then discussed the reactions we had. It was really about developing an awareness of what random things can trigger us unconsciously into another emotional state. And how to catch ourselves and consciously change our state back or to a better state. One night they played the sound of ice cubes dropping into a glass… I envisioned my grandfather and I having a 7-Up, while all around me the children of alcoholic parents were going crazy! Just hearing the sound of ice cubes can send someone over the edge! They got over it then and there. Over the next 15 years I took every one of their workshops — and a few of them several times! It never ceased to amaze me what would change in my world after I reconciled some issue blocking me from being effective — first, I realized that most ‘realities’ were merely a point-of-view. When I changed my point-of-view — things changed. We learned scuba-diving as well as many metaphors useful to everyday life gleaned from that training. I started taking karate lessons about the same time I started JIAN (now rebranded as Business Power Tools) in 1988. I have a 2nd degree Black Belt in TaeKwonDo. Today, I have 780+ hours and I’m instrument-rated. I even owned a 1980 Beech V-tail Bonanza (V35B). There are many things one can learn about business from flying an airplane! I can’t tell you how many self-help, psychology, and business books I’ve read. Every one of them had at least several gems. I sold electronic components for Texas Instruments. I was the Electronics Buyer for The Sharper Image catalog. I even acted in TV commercials for Chevrolet, Honda, Toyota, Yuban, and SuperCuts! I worked with former summit trainers and former EST trainers who consulted with me for my company for many years. I belonged to TEC (now Vistage) — 12-15 company CEOs meet once a month, learn something profound from an expert, have lunch, then spend the afternoon solving each others’ problems. I could turn every session into a Business Power Tools software product! Believe me, I would never have undertaken to write this book if there wasn’t something more to say. Everything I learned, I applied to my own business. This is what Business Black Belt is about. I have a lot to say, but I say it all for a reason! I share many anecdotes that will help you keep your head on straight. My instructions to my editor were to make sure everything makes sense and that my ego is left out. but you can get the point immediately — enough to take the right action. You can ask for Business Black Belt by name at your bookstore — they may have it in stock or can get it for you very quickly. (ISBN # 1-56811-016-2) 356 pages. Hard cover.